Irish whiskey is softer, sweeter and lighter than most Scotches, Bourbons, and other World malts. It is a breed apart: particularly easy going, approachable, and lyrical. It generally has a fresh and "green" aspect that conveys Ireland to me beautifully. And like Ireland, it hides a history alternately ancient, noble, joyous, and also dark - full of pain, loss, and catastrophic death. 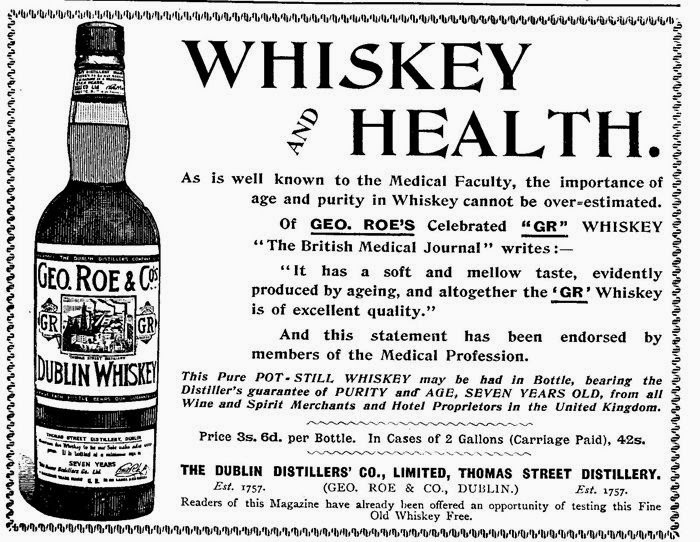 Ireland is the birthplace of whiskey. Irish monks were particularly scholarly and wide ranging - helping to retain and disseminate classical learning through Islamic sources when this knowledge had all but entirely disappeared from the West - providing a vital link between the Classical and Medieval world. Along with classical knowledge, the monks also brought Islamic advances in mathematics and sciences such as chemistry including the Alembic still in around 1000 AD. The Alembic had been invented to intensify perfumes and tinctures in the Middle East. Not surprisingly, the intrepid monks applied the method to barley beer (an art well practiced in Ireland as any drinker can attest), producing probably the first malt whiskies in the world in the 11th or 12th centuries. Potcheen production became part of agricultural life, hospitality, and medical practice. This topic is well discussed in Fred Minnick's Whiskey Women. Ireland produced whiskey for export early as well in the industrial era - and was particularly popular in the US in the 19th century. Whiskey production in Ireland boomed and there were dozens of distilleries thriving producing grain, blended, malt, and pure pot still style whiskey in the first decades of the 20th century. Irish whiskey's heyday was before Prohibition. This ad is from 1897. This 1904 sign says so very much. But then a parade of disasters struck the Irish whiskey industry. First Prohibition wrecked the US export market, which had been the largest market, in the teens and twenties. The Irish War of Independence and the Irish Civil war deeply disrupted local industry, agricultural production, and trade in that same period - a vicious double whammy. Then a series of trade disputes with England following Independence led to the loss of export markets to the British Commonwealth. As a result, virtually all of Ireland's whiskey distilleries went bankrupt in the decades between the 1930s and the 1950s. Ultimately leaving just two: Bushmill's, in the Northern Ireland, and Midleton in the Irish Republic. Lately the global whiskey boom has floated boats in Ireland too and there has been a boom in new whiskey brands and plans for new distilleries. First Bushmill's and Midleton were joined by Cooley Distillery - John Teeling's resurrection of a native Irish owned distilling tradition dating to the late 1980s. Cooley proved innovative and ambitious, reviving beloved and vanished brands such as Kilbeggan (and laying the foundation of the reopening of that distillery in the past few years - with spirit from there on the way) to creating interesting iconoclastic expressions such as Connemara's Turf Mor - double distilled and peated. Cooley was purchased by Beam International in 2012. Other recent projects (all within the last half decade) have started distilling, with spirit on the way, including West Cork Distilleries, Dingle Distillery, Alltech Craft, and Echlinville in Northern Ireland. Like in the US whiskey market, the explosion of interest and demand has led to a number of companies issuing independent bottlings and using the proceeds to develop their own distilleries. Examples include Teeling's - a new distillery project planned for urban Dublin, with a brand of whiskey rolling out in the USA on April 1st with juice from Cooley to pay the way. Tullamore Dew - owned by the Scottish whiskey company William Grant - is selling whiskey from Midleton, but is also building a distillery in Tullamore to re-establish a once proud distilling tradition there. There has also been a boom in independent bottlers getting whiskey from the existing distilleries - and experiencing a growth in distribution. Some of these brands include Knappogue Castle, a brand created by Castle Brands, a company founded in the 1980s by American Mark Edwin Andrews (an oil executive and former Assistant Secretary of the US Navy). Knappogue Castle was initially known for bottling some monster casks of very old pure pot still whiskey from vanished distilleries. 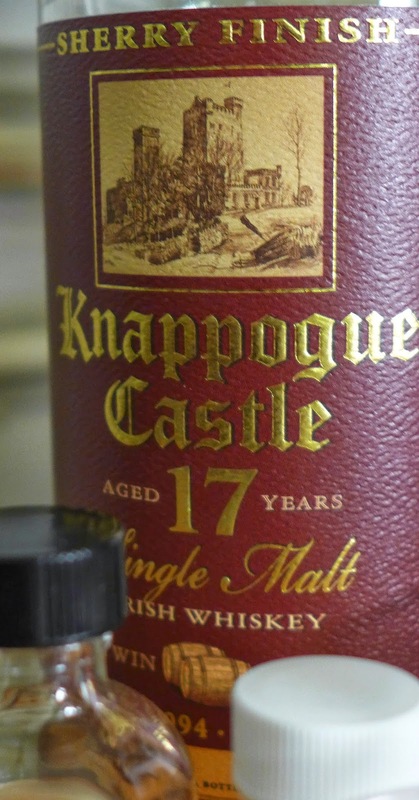 More recently Knappogue Castle is known for vintage dated independent bottlings of what is supposed to be Bushmills. My tastings certainly bear that out. Castle Brands has recently started selling a blend too, called Clontarf 1014. 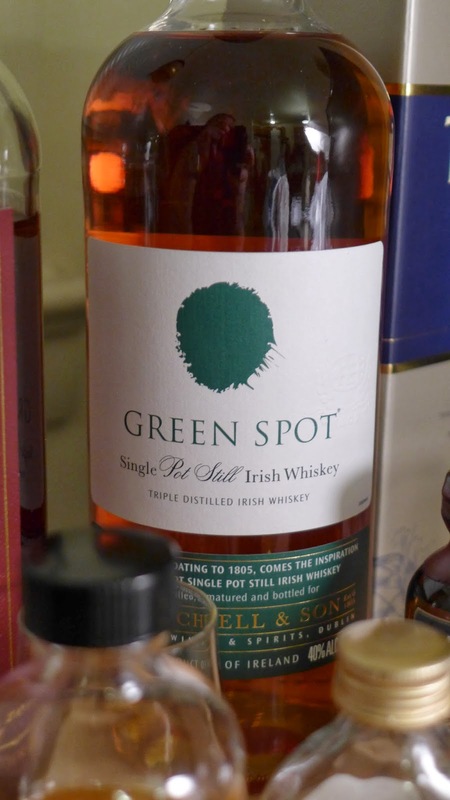 Another, older, native Irish IB is Mitchell and Son's - which has recently started selling Green Spot and the US (and is also known for it's older Yellow Spot). In order to get a handle on this activity I've engaged in some tastings. 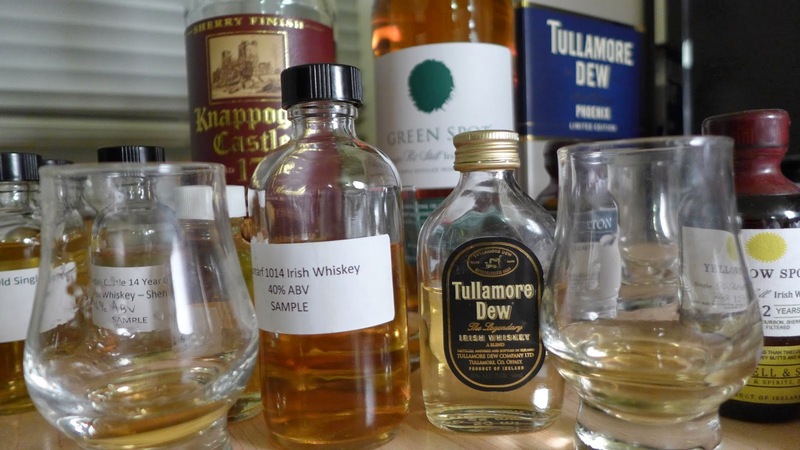 Coming off of a lot of Bourbon and rye tastings lately, the first thing that really comes home is how light and gentle Irish whiskey, generally, is. Smooth, sweet, and creamy - Irish has spirit heat but little bite. Irish whiskey is, generally, constructed from the ground up for this constellation of attributes - triple distillation, malting in sealed kilns, the use of malted and unmalted grain, etc... This balance once led Irish whiskey to be the most popular whiskey in the world and is trending in that way again. Lightness, smoothness, creaminess, and uncomplicated sweetness are beguiling things for a certain kind of drinking. But they aren't "kick in the pants" flavor bombs. This is changing too with cask strength, over-proof, and more complicated offerings in recent years, with varying degrees of success. Today's post will look at a selection of the resurrecting distilleries and IBs - just in time for St. Patrick's Day. Happy St. Patrick's Day! Why do so many whiskey bloggers post about Irish whiskey on St. Patrick's Day? Certainly it's like Christmas for Irish whiskey brands. But Irish whiskey isn't just for St. Patrick's day, people. They are for when you want the green minty flavors of the Emerald Isle on your tongue and shining in your heart! Teeling's Blended Irish Whiskey 46% abv. purchase some of the Cooley stuff in an ongoing to way to help finance plans to build a distillery in Dublin. As a twist, they are doing an Angel's Envy style barrel management scheme where the blended whiskey from Cooley is finished in ex-Nicaraguan rum casks. The symbol of the phoenix on the bottle represents the resurrection of Irish whiskey. 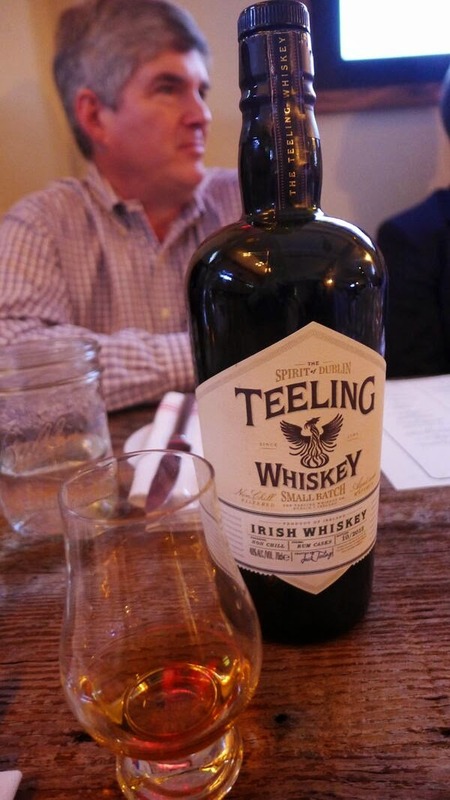 The Teeling family brought it back to Ireland with Cooley, then sold it to Beam and is now doing it again with Teeling. Given that Cooley was the most exciting thing in Irish whiskey in a century, I'm kinda psyched to see where this project goes. Palate: White fudge frosting and floral vanilla opening, shifting into malty honey with a kiss of fruit tart acid. I get caramelized pineapple - but gentle. This is followed by a dry light tannic finish. There is a good intensity of flavor here and a very pleasant drinkable balance. This one works for me. Expected to hit the US market around $50 on 4/1/14 it seems a tad pricey for blended Irish whiskey - but the wood management twist and higher ABV help take this one to a level where it doesn't seem stupid. The base expression from William Grant owned, Midleton sourced Tullamore Dew - it promises to be in the Powers Gold wheelhouse of flavors. Palate is unexpectedly firm with a sweet honeyed malt opening. The mid-palate sees a handoff to light fruity grain whiskey flavors (gum, fruity jellies) and a light mint note. The finish is short and ends on a slightly young grain note. The opening is the strength here. Light, sweet, sippable, and easy. The grainy finish is common at the price point - and easily rectified by simply sipping more. An exciting wrinkle: blended Irish whiskey over proof at 55% and finished in sherry casks and says non-chill filtered. On the down side it's NAS and doesn't mention color - so thus might have e150. 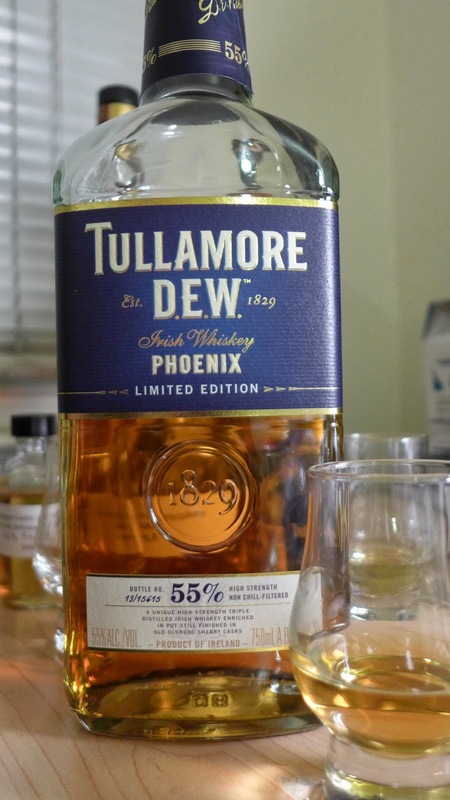 The phoenix in the name - and the rising bird symbol on the bottle strikingly like Teeling's - refers to Tullamore's recovery after a fire caused by a ballooning accident in 1785. This is considered the world's first aviation disaster and is the subject of annual festival in Tullamore called The Phoenix Festival. This is obviously a whole theme in Ireland, where resurrection from disaster is a national narrative. This version is limited at 15,615 bottles. This one is number 13 of 15,615. Nose: Faint linseed oil, spirit, solvent, sweet white raisins. Palate, bright and razor sharp. Solvent, mint, oak. Rich oak with a sherry aspect. Then a bit of spirit heat and tannin spice. The sense of oak cask is intensified with more air, time, and a drop of water. The oak carries through on the finish too. Intense, spirity, and strong, Yet the classic Irish sweet and mint notes show clearly beneath the oak cask and sherry flavors. The spirit heat on this is fierce. It brings an intensity of flavor - but that doesn't mean a complexity. There's plenty of oak here and some of the vinous sherry flavors, sweet and heat and a good volume of oak flavors. On the whole this is a solid Irish sipping whiskey but comes off as a bit pointed and sharp. More time would help take it into epic. As it is, it's pretty darn decent. Nose: spring grass, malt, anise seed, fresh mead. Palate: Creamy sweet grassy mash. The expansion hits with the green and minty note that screams "Bushmills" at me loud and clear. This is a lot like the Bushmill's 10 single malt expression. There is spirit heat and some gentle oak on the turn to the finish, which is exceedingly gentle and brief. A delicate, acceptable Irish single malt, but without a distinctive angle. It shares the strengths, and in my opinion, the weaknesses of Bushmill's Single Malt 10, with whose price point it shares, but brings a freshness and a bit more fruitiness to the flavor signature. I'd take this over Bushmill's 10, but I definitely prefer the others in the line. Nose: Grassy sweet aroma of heather, white frosting, some distant dried yellow flowers. 14 years in bourbon barrels, 21 months in sherry casks. 4500 bottles total. Nose: Grassy fresh, but joined by a bit of vanilla, citrus, fig, and notes of oak and sherry cask. It's a light and pleasant nose - with distinctly more going on. Palate: The opening is more gentle than the 14 (40% as opposed to 46%) but the sherry finish actually shows up. Sweet with some vinous raisins and fig on the opening. The minty green shows on the expansion. The turn to the finish shows oak spice and tannin spiciness which warms with clove-like heat. But the shelved down intensity of 40% leaves me wanting more. Nose: Again, grassy and fresh with gentle hints of vanilla, raisins, lemon, and fig. It's a soft and gentle nose. In direct head to head nosing with the other Knappogue Castles it is distinctly darker and oakier than the others - but only in a relative way. Palate: sweet and distinctly figgy on the opening. The expansion gives a greater sense of sherry cask - but the minty green aspect of Bushmills is still readily evident. No surprise, given that most of the maturation takes place in ex-bourbon casks and the sherry finish is for the last 21 months of maturation. The extra time gives a bit of added richness - but this is still impressively light and fresh. The main sign of the extra maturation is more oak in the nose. From the cut sheet: "Clontarf 1014 is triple-distilled, filtered through Atlantic Irish oak charcoal, and aged four years in bourbon barrels: ten percent is pot stilled single malt whiskey; the rest of the blend is a combination of pot stilled and column stilled grain whiskey. The whiskey comes from Dublin." Nose: heathery, light talcum, honey, bubble gum, and distant iodine. Palate: sweet vanilla fudge on opening, but immediately complicated by salty sea air, firm malt, and some lovely sweet chewing gum grain whiskey notes. Soft and easy drinking, with a short sweet finish. This has some complications and twists pretty unusual in a $20 bottle of blended whiskey in the form of those iodine notes and sea breeze. In a head to head between Clontarf 1014 and Tullamore Dew the similarities are more apparent than any difference. I give Clontarf the slight edge because of the complexity of salt and a bit of iodine. 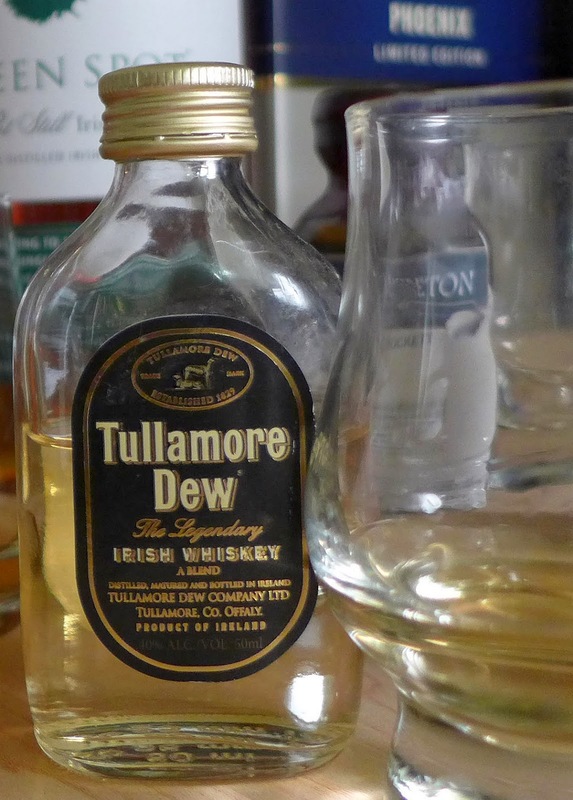 But Tullamore Dew's gentle uncomplicated take on the same set of flavors might be more pleasing to some. Personally I'll take this any day. Enough going on to be worth sipping and cheap enough at $20 to be used heedlessly. Color: dark old gold with light amber tones. Nose: cream caramel, honey, heather, light sherry tones of fig, and leather. Underneath is fruity sweet floral tones. Nosing deeper, you get more sweetness and complexity. For 8 year old whiskey this is pretty rocking. Palate: big sweet creamy opening. White fudge, honey vanilla cream, then mint, faint sherry notes of black raisins and figs. The expansion has the green and minty flavor signature of Jameson's - so very Irish! There are some light grainy alcohol notes at the turn, but malt and grain and seeds dominate the finish. This one has a buttery aspect that takes it into a different level than most blended Irish whiskies. It's a visceral creaminess - a textural thing - to go with the creamy flavors so characteristically Irish. This is of a piece - and yet clearly something special. It's been released at $45. Definitely worth a taste at that level. Extra aging to 12 years and higher proof at 46% are the edge here. Yet, the extra years add wood and oak tannins, spice and heat and fruity intensity. Nose: Cream caramel, and honey malt made mellow by rich oak and fruity wine gums. Figs, gooseberries, and something tropical (mangoes and papayas). Nosing deeper, I'm getting some butterscotch. Nice. Really nice. Palate: Buttery, creamy, sweet, and candied on the opening. Lovely viscosity in the mouth. There is a big expansion of flavors after that sweet dessert-like opening: sherried and madeira'd flavors that include tart acids and lots of tropical fruits - creamy mangos, gooseberries, thimble berries. Underneath is clearly the minty green of Jameson's and Ireland, but the tartness and fruitiness really put on a show. Plus there is a big oak presence. The turn shows this oak growing, but a goji-berry sweet-tart quality hangs on. This fruity and oaky quality yields a fairly long finish. This is a Red Breast 15 like presentation, but more fruit forward. Pretty stand-out stuff. Is it $100 stuff? Tough competition from top Scotches at the price - but this is definitely a contender in the pure pot still style at a bit under. I would definitely seek this out. Full disclosure of sources: My bottles: Tullamore Dew, Tullamore Dew Phoenix, Knappogue Castle 17, Green Spot. Teeling's Sample graciously poured for me by Jack Teeling at a tasting I was invited to by the Baddish group, PR. Knappogue Castle 12, 14, 16 and Contarf 1014 samples also provided by Laura Baddish - of the Baddish Group, PR. Yellow Spot sample provided by my friend Eric Sanford. That Robertson's ad is something else - quite a find. 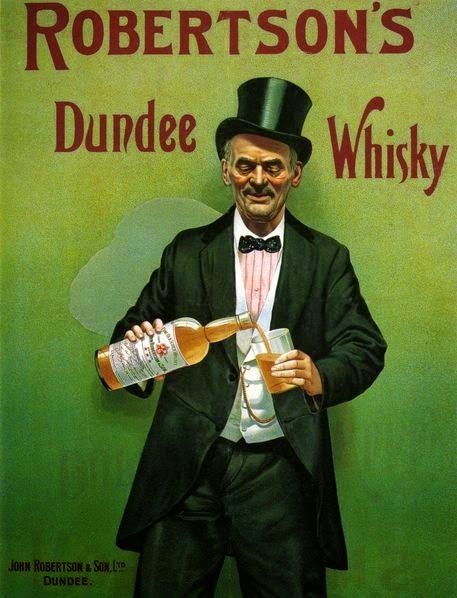 It looks like he put on his top hat, bowtie and waistcoat to lean against a wall with peeling green paint and pour himself a nice 10 oz glass (or two) from what appears to be a 1.5 liter bottle of whisky.